For more than 100 years, NICB has partnered with the insurance industry, law enforcement and others to identify opportunities for battling insurance crime. We currently have more than 1,100 member property-casualty insurance companies, who collectively wrote in excess of $496 billion in premiums in 2018. Our members represent 92 percent of the nation’s personal auto insurance premiums and 81 percent of all property-casualty insurance premiums. Greater utilization of NICB services leads to more powerful results in fighting insurance crime and a higher return on NICB investment for members. Working with our staff, NICB membership directors conduct ongoing outreach efforts to boost awareness of all member benefits and services and encourage our members to take full advantage of all that NICB has to offer. 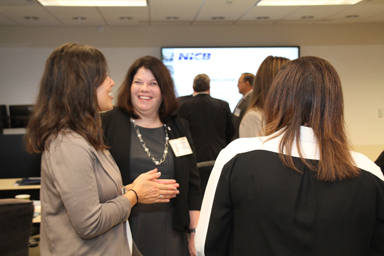 Together with NICB staff from each of our core functions, our membership directors arrange valuable one-on-one meetings with member companies to help analyze their fraud-fighting needs, review their use of NICB products and services, and ensure appropriate ongoing follow-up. To ensure that we are staying true to our mission and meeting our members’ needs, NICB conducts periodic member satisfaction surveys that solicit in-depth feedback and suggestions. NICB staff follows up personally with individuals who include contact information to let them know we are listening and welcome their comments. View how an NICB membership can enhance your organization's insurance fraud and theft capabilities. The insular possessions of the United States. Access to the ISO ClaimSearch® database is required to become an Active Member. *No Active Member, which is or may hereafter be affiliated with, owned or controlled by, operated in the same interest or under any direct, mutual or common management with any other company (or companies) engaged in the business of writing insurance (an "Affiliate") may remain an Active Member unless each such Affiliate also is or immediately becomes an Active Member (unless otherwise determined by NICB’s President after taking into consideration the equities and fairness to the Active Member and the membership of the application of this By-Law). All Active Members that are Affiliates of one another are treated as one member for all voting right purposes. Associate Members have all rights and privileges of membership except they do not have voting rights. Other organizations as may be approved by the NICB Board of Governors. Strategic Partners include organizations that are not eligible for Active or Associate membership, but have a strong interest in working collaboratively with NICB to put a stop to insurance fraud and theft. See the Law Enforcement section for more information on NICB services for law enforcement.